Okay. Toboganning isn’t an Olympic sport. But it was in the spirit of the Olympics that we trekked out in 17*F (-8.3*C) weather to slide down the ice like the lugers and bobsledders we’ve been watching in Sochi. We weren’t the only ones; far from it. On what we Cincinnatians consider a bitterly cold day, Clevelanders were out in droves. We waited in line for an hour to hurtle down the toboggan chute at what felt like 70 miles an hour. The ride was over in a minute. Then we trekked up the stairs, stood in the freezing cold dusk, and did it again. 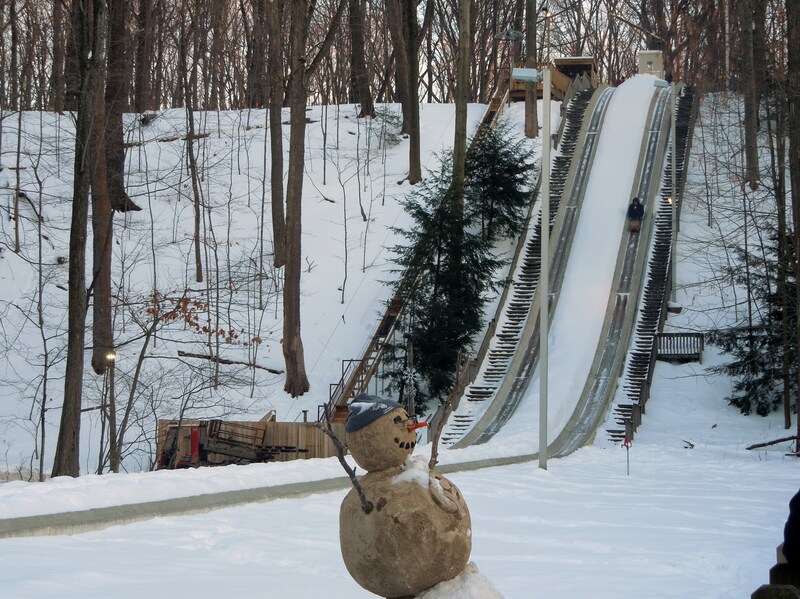 For $10/person, you could ride the chutes all day at The Chalet in Strongsville, Ohio. It is a unique part of the Cleveland MetroParks that topped our list of things to do on a weekend in Cleveland, Ohio. 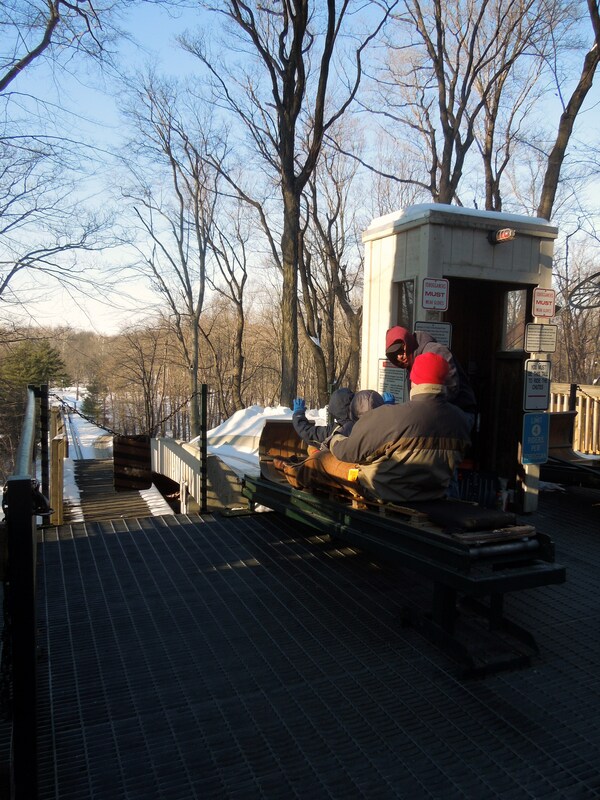 Especially in the dead of winter (January, February, March), which is the only time the toboggan chutes are open. If it gets too warm, or the ice is affected, the chutes close. So the toe-tingling frigid temps meant we were in luck. We climbed aboard our toboggan. Four people can fit on one, with the riders layering their legs over the legs of the person in from of them like a human train. 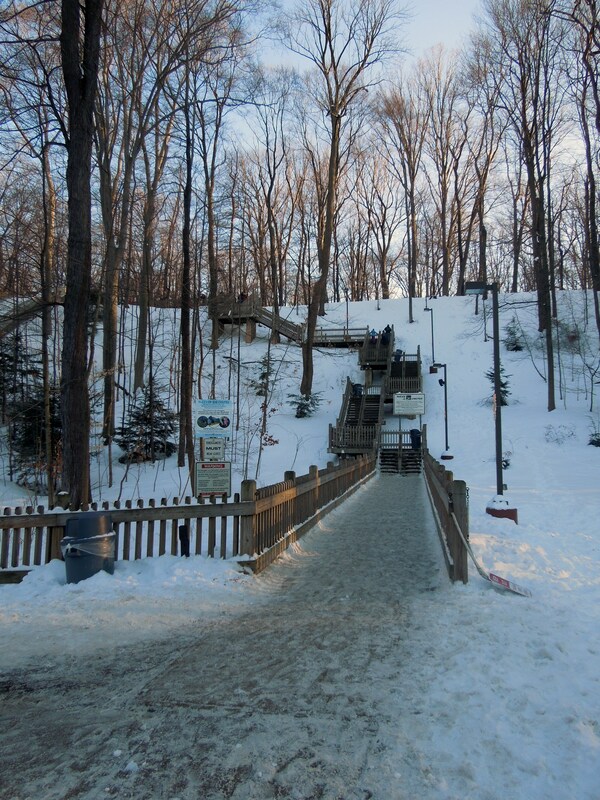 Then we grabbed the rope handles, tucked in our elbows, and went careening down the ice on a rollercoaster of a hill. My fur hood blew off the minute we went over the edge despite the fact that I’d tied it on. My husband’s lips froze to his teeth. I screamed all the way down as we barreled across the ice and I wondered how we’d ever stop. We ran up onto a stretch of rubber matting. That’s how. 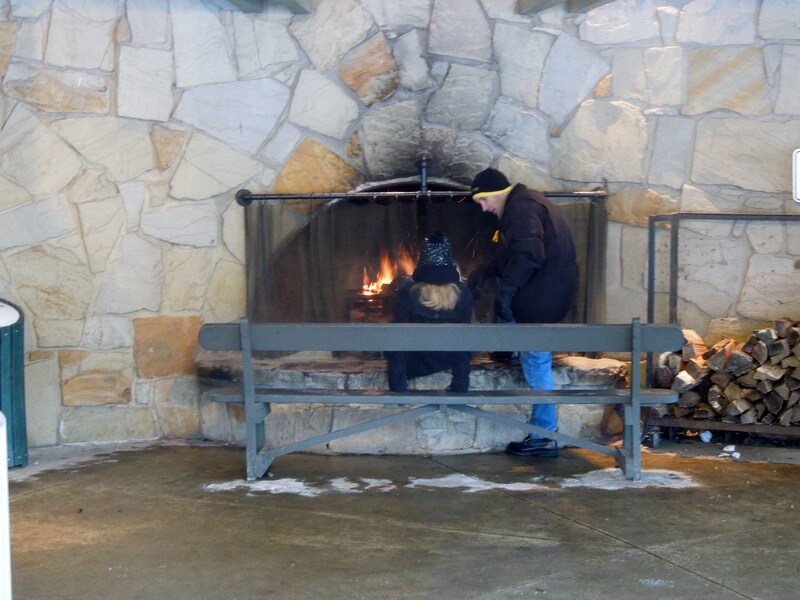 Exhilarated and frozen stiff, we ran over to warm up by the fire. Our fingers and toes felt frostbitten. Our cheeks were chapped. The sun was setting and we debated for a moment — take another chilly ride down the chute in the dark? Or thaw out over dinner and save the next winter sporting activity for a day above freezing? Would 17-degree temps keep you inside? Or would wintertime fun lure you outdoors? ← I Could Be An Olympian! I wonder if they’re still there? We had so much fun. I think we might wit for a warmer day before we do it again. Of course, that will probably mean the lines are even longer. Isn’t that snowman cute? Made of stone. I thought that was clever. Me, too! We’ll go back. Looks like so much fun ~ cold fun, but fun nonetheless! Nothing better than de-thawing after an afternoon in the cold! Both of my kids always loved playing in snow. I have to layer like crazy and freeze anyway, but they could spend all day outside. If you get the chance, do! I was nervous at first. I sat in the front of our toboggan and screamed my head off. It went much faster than I expected and never slowed down. It was thrilling. I couldn’t wait to do it again. Wooh! -17 is super duper cold. But that sounds like so much fun! It’s been so frigid all winter that we finally just accepted it and went outside anyway. But it chilled us to the bone. It sounds like you would love this, Lillian. I think people that can play and have fun in the snow are truly young at heart. It was so much fun. I’d do it again in a heartbeat. Looks great fun. The snowman is great. He was cute. Definitely added to the festive winter fun of it. So what I hear is that this is the perfect temperature to blow freezable bubbles. It sounds very cold to me, though – I would have to learn a few coping tricks first. The luge looks like a lot of fun (the queuing for an hour less so, but what can you do?) so between that and the bubbles I would probably have to head out. A few weeks ago, it was 0*F and we tried the bubble trick. It didn’t work as well as this other experiment we did. You boil a pan of water, then take it outside and throw the water up in the air. It evaporates immediately. It was so cool (pun intended) that we did it over and over again. This has been a record cold winter for us, but fun in some ways, too. That’s a good one! Slightly less easy to organise in a hotel room, though. I’m starting to see the sense in those travel kettles. Good for you! Sounds and looks like so much fun. A lot different from those little hills!!!! It was fun, Nancy. And scary. And thrilling. Next time, maybe we’ll have a little more bearable temperatures. Oh now I can say I miss the snow! You’ve really reminded me how much fun it was when I was a kid and my Dad took us for a week to Tahoe in the winters… we rode innertubes down the hills of snow all day long, freezing our hineys off! Great fun! Thanks for the great memories! Hahaha. So true. You missed a brutal Cincinnati winter this year. We are definitely babies compared to our northern Ohio friends. 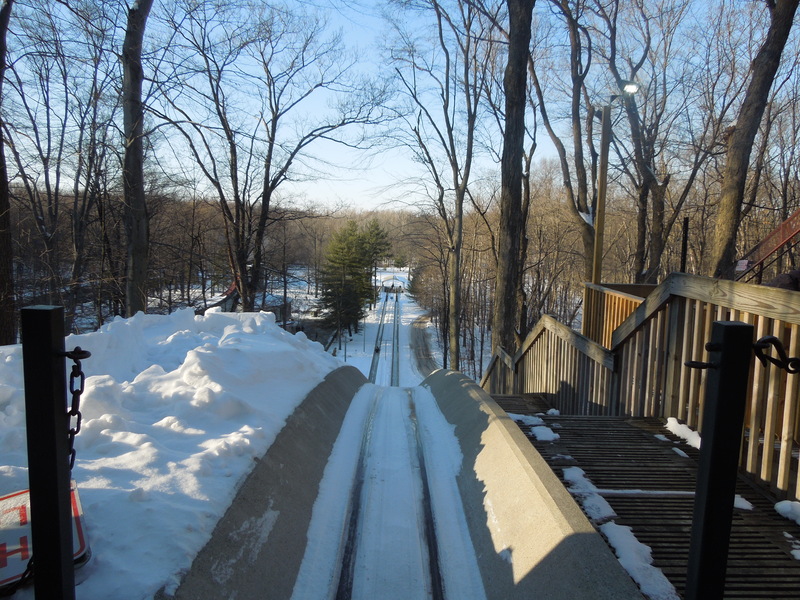 The other nice part about this is that there was a toboggan lift that sent the toboggans back up. Climbing the stairs wasn’t bad, but definitely took a lot longer than zooming down the ice. Thank goodness you didn’t have to carry the toboggans back up yourselves- oof! What a fun experience and I loved the caption! Nice post. Not for me (I’d be the one holding the bags at the bottom) but it’s great to see people in harmony with the harsh elements rather than in conflict, for a change. We were amazed at all the people enjoying the Cleveland parks on such a bitterly cold day. There were senior citizens, toddlers, people walking dogs, runners, etc.. The cold didn’t seem to stop anyone there the way it does a few hours south where I live. I thought so! My friends went down the toboggan at the Great Wall, but I was there with a tour and didn’t get to. It sounded like so much fun. Next time, for sure. So much fun! What a fantastic way to make the best of this cruel winter we’re having. I know. The old “If you can’t beat ’em, join ’em” mentality. We gave into the cold and had fun.